Brewing kettles at the Turk's Head Brewery. The brewery isn’t extensive, yet seeing the production of the country’s only native beer is fascinating. Turk's and Caicos's own lager, amber and IPA at the brewery's tasting room. Turk's Head Brewery began formal operations in 2001 as the Turks and Caicos Island's first and (to this day) only brewery operation. 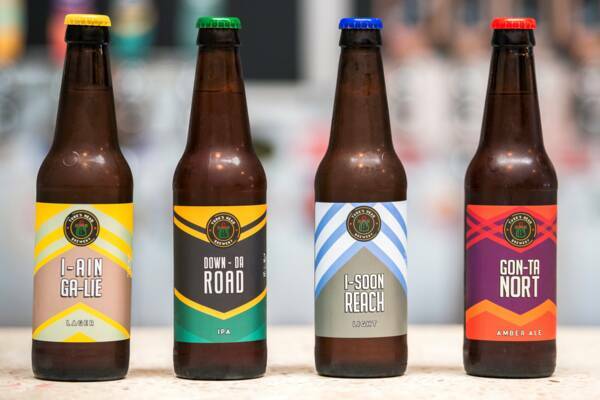 Located in central Providenciales, this brewery currently produces 4 varieties of beer and lager, Turk's Head Lager, Turk's Head Amber, Island Hopping Ale (IPA) and Turk's Head Lite (a light lager). Bottles, cans, and kegs for the taps are all produced. Seasonal selections are occasionally produced as well, such as a stout for St Patrick's Day. The beer is mostly barley-derived from grains imported from the United States and Germany. Five different types of hops, which provide flavour, aroma and bitterness to beer, are used, and are sourced from the Pacific Northwest, New Zealand and other countries. 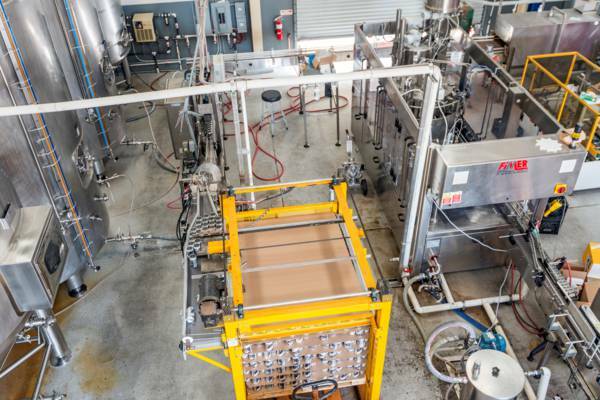 Operations were expanded recently, and now include two full-time brewers. Plans are in the mix for additional varieties and craft beers and beverages. The brewery produces more than 200 brews annually, which is the equivalent to over 2 million bottles. Lager brews take around 5 weeks, and ales can be produced in a week. Their beers are sold throughout the island at nearly every bar and restaurant. Their logo of a Turk's Head Cactus with a beach background incorporates one of our national symbols. As the only beer made in the Turks and Caicos, Turk's Head can be found at nearly all bars, restaurants, hotels and resorts in the country. The canning equipment at the brewery. Tours are offered 5 days a week, Monday through Friday at 11 AM, 1 PM and 3 PM. Call before to ensure availability and time. Tours take you on a catwalk over the Brewery Hall and culminate at the Tasting Room, where visitors can sample the different types of beer produced. Ticket price is $15 for adults. The guided tours are around 30 minutes, not including a final stop in the tasting room and gift shop. A range of shirts, can and bottle cozys, trinkets and other souvenirs are available for purchase in the gift shop. The Best Price for Beer! 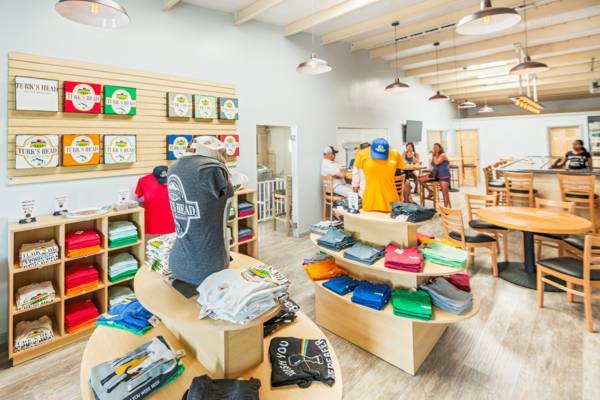 TC Crystal Water and the Turk's Head Brewery are located at the same site at Discovery Bay in Providenciales, and bottled drinking water (small bottles, gallon bottles and 5 gallon water cooler jugs) and cases of beer can be bought at the at the onsite shop. The 24 bottle case of Turks Head sold here is the cheapest price for beer on the island, and typically sells for around $10 less per case than anywhere else. Turk’s Head Brewery is located at TC Crystal Water building on the main paved bypass road between Leeward Highway and South Dock Road. This bypass road is Universal Drive, yet is incorrectly referred to on some maps as part of South Dock Road. This general area is the interior Discovery Bay region of Providenciales. When driving from Grace Bay, take the first exit left on the First Caribbean Roundabout (the one after the large Do It Best building centre). Continue for 1000 feet (300m), and TC Crystal and the Turk’s Head Brewery will be on your left. The gift shop and tap room at the Turk's Head Brewery.